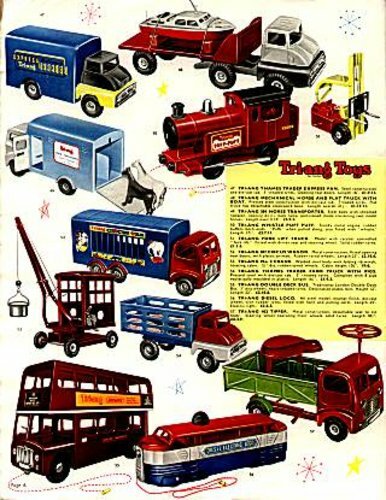 Lines Bros. Ltd was a British toy manufacturer of the 20th Century - operating principally under the Tri-ang brand name. At its peak, the company claimed to be the largest toy maker in the world. The British range of Tri-ang large scale pressed steel vehicles were produced from the early 1930’s through until the mid-1970’s. The total selection of pressed steel vehicles consisted of over 200 different types. Tri-ang was one of the largest toy producers in the world and their range of toys reflected this. George and Joseph Lines made wooden toys in the Victorian age, their company being G & J Lines Ltd. Joseph was the active partner while George went into farming. Joseph (or Joe) had four sons. Three of these formed Lines Bros Ltd soon after World War One. These three were William, Walter and Arthur Edwin Lines. Three Lines making a triangle - hence Tri-ang. Arthur's son, Richard Lines, was largely responsible for the Tri-ang Railways system. At the start of the Second World War, production of children's toys was deemed non-essential by the British Government. As a result, production facilities were converted to weapons manufacture. Manufacture of toys resumed shortly after the war ended. In 1947 Lines Brothers founded a company in Canada. The trade mark used in Canada was the thistle which had first been used their father Joseph Lines so many years before. In 1951 Lines Brothers purchased fifty percent of the Australian toy company Cyclops which became Cyclops & Lines Brothers (Australia) Ltd.
That year Lines Brothers also took over Rovex Plastics Ltd., which they devoted to production of electric railways. They were able to sell the new trains at such low prices that a whole new market opened up. Rovex Scale Models Ltd. moved to a new factory in Margate, Kent, where they produced the Tri-ang real scale model electric railway system. In 1955 Lines Brothers purchased the remaining 50% of Cyclops & Lines Brothers (Australia) Ltd. In 1956 Lines Brothers took over an Australian company called Moldex Ltd. This company produced a range of plastic products and so were able to produce the Tri-ang scale model railways and Pedigree dolls. In 1957 Lines Brothers took over the pram company Simpson Fawcett. 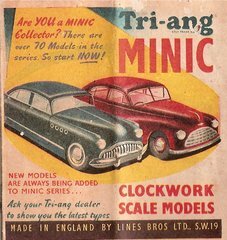 In 1958 Tri-ang bought a company named Mini Models. This company used the trade mark Scalex and had introduced Scalextrics in 1952. Tri-ang improved the design and reduced its costs which was met with popular approval. The Tri-ang empire created by Lines Brothers now claimed to be the largest toy manufacturer in the world. Pedigree launched Sindy in 1962. The teenage doll quickly became the new rival of the American doll, Barbie. Lines Brothers brought Meccano Ltd. which included Dinky Toys from Hornby in 1964. To increase sales of the financially-struggling Meccano, Lines Brothers introduced other products which brought it up-to-date. They introduced Play-Doh, Cliki and Cliki-Plus, similar to Lego, in this first year. In 1971, due to failing business overseas and uncertain demand in the UK, Lines Brothers, now the biggest toy manufacturer in the UK, collapsed.